I recently purchased some more of the George Nightingale & Co Stereocards, produced in Britain around 1920 and sold in aid of ex-servicemen. They give a real insight into the Aftermath of the Great War and they will feature on the site over the next few weeks. This image shows Hooge Crater Cemetery around 1920. This cemetery had been started by burial officers in October 1917 and there were less than a hundred graves by the end of the war; however it was chosen as one of the sites to become a main concentration cemetery and burials were moved in from 1919 creating a burial ground with more than 2300 graves. Given the angle of the photograph, it is taken to the rear of the cemetery looking up the slope of the Menin Road Ridge towards Hooge itself. 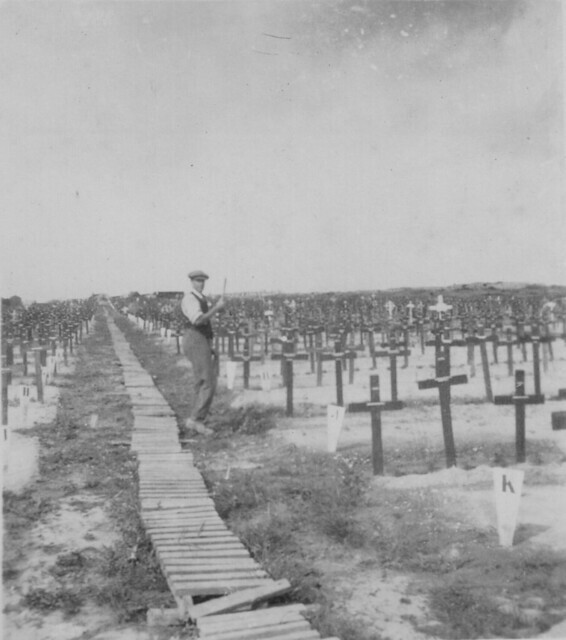 Among the standard wooden crosses with their metal ‘ticker-tape’ name tabs are numerous individualised graves brought in from other cemetery to form the neat rows visible here. Great War period duckboards form the walk way and the gentlemen in the photo is likely to be an early Imperial War Graves Commission gardener. This entry was posted on 14/05/2012 by sommecourt. It was filed under Battlefields, Belgium, Flanders, Great War, War Cemetery, WW1, Ypres and was tagged with Aftermath, Flanders, Hooge, War Cemetery, WW1, Ypres. A great photo. There is just something about seeing all those crosses, compared to the modern stones, that is just so emotive. A raw image. Catastrophically damaged land, weed infested soil, rough rubble just beneath the surface, plank path to the desolate infinity, kept in a carefully-preserved uncompromisingly silent photograph. Such a powerful photograph; the scale, the dereliction. Horrific.